Painting helmet lenses can be tricky for some folks. This step by step might make it easier for those just starting out to get better results without killing themselves trying to paint within the tiny helmet lense space provided. Once you get the hang of it, you can do it without needing to take these steps and just paint within the space there. You just need a steady hand a fine brush to do it. Until then, try this out. Games Workshop was kind enough to show us how to do it on their site. Trouble is, you have to try and do all the work inside the tiny eye socket space since you've already painted everything else. 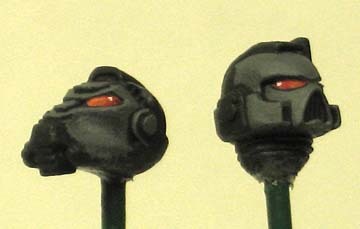 The trick I found with painting helmet lenses is to do them first. Even now, when I can paint well within the lines, I still do them first so that I can clean up the space around them if I make any mistakes. In this case we prime them black. No detail painting just yet. 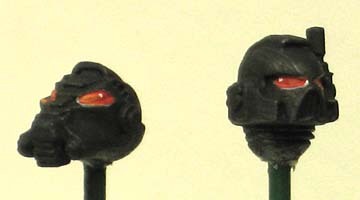 In order to get the bright eyes that we want on these, we'll paint over the eye sockets with white. No need to worry if you get any on the armour. We'll clean it up when we're done. Next up is the base color which happens to be red. Again, just get it on there. Now the hardest part. Painting the white dot and the highlight. I start with the highlight first. I'll get a little bit of paint (slightly thinned so it flows nicely) on my brush and actually start my brush stroke on the model's nose and drag it across the helmet lense. As I run out of paint, it feathers the highlight on the lense itself. With a little bit of practice, you can really get it exactly where you want it. Then a small dab of white in the upper corner. Now the super tricky part. Go back in with black and clean up around the helmet lenses. This makes your previously sloppy paint job look like a million dollars. After that, it's add your armour base coat and keep working like nothing ever happened. Two key points to remember though if you go this route. 1. 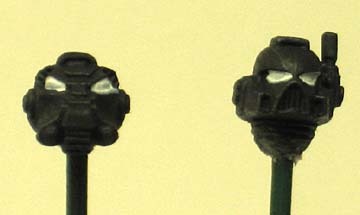 You can't just throw your armour basecoat on, you have to paint AROUND the lenses. 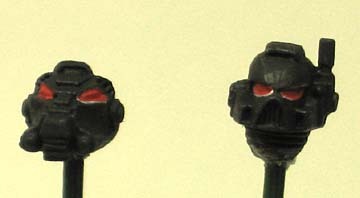 This can prevent you from using spray paint as a base coat unless you spray the model, go in and paint the eyes and then have a brush on paint that matches the original spray color so you can clean up your edges (I do this sometimes). Painting around the eyes beats trying to paint inside them later on. 2. You can't just slap on a wash for shading. You'll need to exercise some degree of control here around the lenses. Another slight trade off. You can still apply a wash, just don't get it in his eyes, not a big deal overall. And that's it, easy as that. This goes back to the whole idea of knowing what to paint and when so you can make it as easy as possible on yourself and still get all the amazing detail you never thought you could do. Darn it, I was planning on writing something just like this! Guess you beat me to it. Good job though. I also strongly suggest you use different shades of red, from dark to bright from back to front, overlapping only slightly, to give the lenses even more plasticity, then, using gloss varnish to give them a real clear look. Though simple blending or pseudo-blending like you used here is equally clean and effective. Harman: You're absolutely correct, add in a few shades of red for a better gradation and the effect is even more convincing. 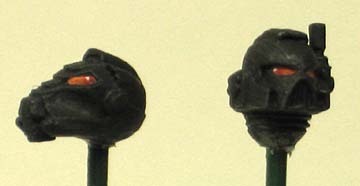 I think the most important tip here is that you can paint the lenses before you paint anything else. In general this is a good idea and I have heard it spoken of as the inside out method. You paint everything from the inside out. So eyes, then flesh, then clothes, then armour and so on. It makes correcting and neatening just that little bit easier. Nice trick, and great tutorial! One question. What does the opposite eye lens look like? 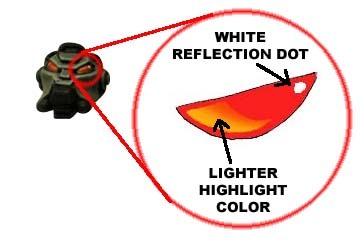 Is it a mirror image of the one shown, where the white dot is the back part of the lens? Or, would it be on the inside tear duct region? That can be tricky. In general, a mirrored approach is standard and well, but in some cases when you're playing around with lighting, you'll see that the white shine doesn't need to be all the way back. It all depends on the context and where the lighting effect on the miniature is directed at. Jason: Basically it's mirrored on the opposite eye lense. The white dot being towards the back with the graduated highlight being closer towards the nose. This is a basic approach though. Like Harman mentioned, the more you get into it, the more you can adjust what you are doing for the specific lighting conditions you're looking to create. Ron- Thanks for the clarification. The key would be consistency. 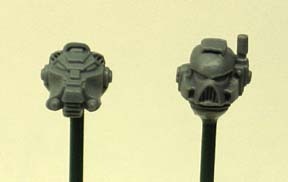 I like the fact you did it with both a termie head and a standard marine helmet. I usually don't paint with a certain light source in mind (going for table top standard), so to do it just for the eyes would be silly. I'll try it out and see what it looks like. Thank you Harman for your comment too.